Who Says You Have To Like A Character? The title character of Elizabeth Strout's Olive Kitteridge is a confused and vindictive wife and mother in a small town on the coast of Maine. She's not at all likable — but that doesn't mean Melissa Bank doesn't love her. 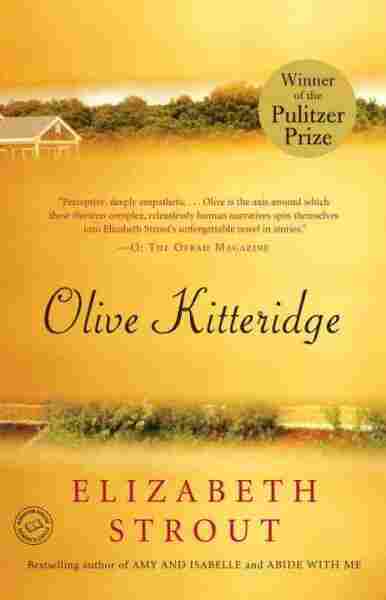 Here's a perfect example of a character you'd never be friends with, but whom you can't stop reading about: Her name is Olive Kitteridge, and she's the title character of Elizabeth Strout's book of short stories. Picture this: Olive on the day of her son's wedding. What is she doing? She's looking through her new daughter-in-law's closet. And she doesn't stop there. She takes a magic marker and draws a black line down the arm of a beige sweater. She steals a bra and one loafer. She imagines her new daughter-in-law saying, "I must be losing my mind." Olive is a character who's as bad as you'd be if you let yourself — and that's partly what drives the book: You can't wait to see what she's going to do next. This is the story about people who live in a small town in Maine — people who might seem ordinary. But they're only as ordinary as we are. You feel that way in every story, I think, because you're privy not only to the characters' private lives but also to their most intimate thoughts — and to secrets they haven't told anyone. There's at least one secret in every story — and one life-changing moment. Maybe that's why this book delivers what you hardly ever get in a literary novel: suspense. Olive Kitteridge is a masterpiece: The writing is so perfect you don't even notice it; the story is so vivid it's less like reading a story than experiencing it firsthand. I was writing about Olive's husband and his secret longing for another woman when I thought, 'I can't say that.' Why? Because I imagined the whole town hearing about it on NPR. It's a book that prevents you from going to sleep at a reasonable hour, that lifts you up and out of the subway, that gives you a double life to lead and changes the life you're in. Olive Kitteridge is a book that will remind you of how much you love to read. You Must Read This is edited and produced by Ellen Silva. The pharmacy was a small two-story building attached to another building that housed separately a hardware store and a small grocery. Each morning Henry parked in the back by the large metal bins, and then entered the pharmacy's back door, and went about switching on the lights, turning up the thermostat, or, if it was summer, getting the fans going. He would open the safe, put money in the register, unlock the front door, wash his hands, put on his white lab coat. The ritual was pleasing, as though the old store — with its shelves of toothpaste, vitamins, cosmetics, hair adornments, even sewing needles and greeting cards, as well as red rubber hot water bottles, enema pumps — was a person altogether steady and steadfast. And any unpleasantness that may have occurred back in his home, any uneasiness at the way his wife often left their bed to wander through their home in the night's darkhours — all this receded like a shoreline as he walked through the safety of his pharmacy. Standing in the back, with the drawers and rows of pills, Henry was cheerful when the phone began to ring, cheerful when Mrs. Merriman came for her blood pressure medicine, or old Cliff Mott arrived for his digitalis, cheerful when he prepared the Valium for Rachel Jones, whose husband ran off the night their baby was born. It was Henry's nature to listen, and many times during the week he would say, "Gosh, I'm awful sorry to hear that," or "Say, isn't that something?" Inwardly, he suffered the quiet trepidations of a man who had witnessed twice in childhood the nervous breakdowns of a mother who had otherwise cared for him with stridency. And so if, as rarely happened, a customer was distressed over a price, or irritated by the quality of an Ace bandage or ice pack, Henry did what he could to rectify things quickly. For many years Mrs. Granger worked for him; her husband was a lobster fisherman, and she seemed to carry with her the cold breeze of the open water, not so eager to please a wary customer. He had to listen with half an ear as he filled prescriptions, to make sure she was not at the cash register dismissing a complaint. More than once he was reminded of that same sensation in watching to see that his wife, Olive, did not bear down too hard on Christopher over a homework assignment or a chore left undone; that sense of his attention hovering — the need to keep everyone content. When he heard a briskness in Mrs. Granger's voice, he would step down from his back post, moving toward the center of the store to talk with the customer himself. Otherwise, Mrs. Granger did her job well. He appreciated that she was not chatty, kept perfect inventory, and almost never called in sick. That she died in her sleep one night astonished him, and left him with some feeling of responsibility, as though he had missed, working alongside her for years, whatever symptom might have shown itself that he, handling his pills and syrups and syringes, could have fixed. "Mousy," his wife said, when he hired the new girl. "Looks just like a mouse." Denise Thibodeau had round cheeks, and small eyes that peeped through her brown-framed glasses. "But a nice mouse," Henry said. "A cute one." "No one's cute who can't stand up straight," Olive said. It was true that Denise's narrow shoulders sloped forward, as though apologizing for something. She was twenty-two, just out of the state university of Vermont. Her husband was also named Henry, and Henry Kitteridge, meeting Henry Thibodeau for the first time, was taken with what he saw as an unself-conscious excellence. The young man was vigorous and sturdy-featured with a light in his eye that seemed to lend a flickering resplendence to his decent, ordinary face. He was a plumber, working in a business owned by his uncle. He and Denise had been married one year. "Not keen on it," Olive said, when he suggested they have the young couple to dinner. Henry let it drop. This was a time when his son — not yet showing the physical signs of adolescence — had become suddenly and strenuously sullen, his mood like a poison shot through the air, and Olive seemed as changed and changeable as Christopher, the two having fast and furious fights that became just as suddenly some blanket of silent intimacy where Henry, clueless, stupefied, would find himself to be the odd man out. But standing in the back parking lot at the end of a late summer day, while he spoke with Denise and Henry Thibodeau, and the sun tucked itself behind the spruce trees, Henry Kitteridge felt such a longing to be in the presence of this young couple, their faces turned to him with a diffident but eager interest as he recalled his own days at the university many years ago, that he said, "Now, say. Olive and I would like you to come for supper soon." He drove home, past the tall pines, past the glimpse of the bay, and thought of the Thibodeaus driving the other way, to their trailer on the outskirts of town. He pictured the trailer, cozy and picked up — for Denise was neat in her habits — and imagined them sharing the news of their day. Denise might say, "He's an easy boss." And Henry might say, "Oh, I like the guy a lot." He pulled into his driveway, which was not a driveway so much as a patch of lawn on top of the hill, and saw Olive in the garden. "Hello, Olive," he said, walking to her. He wanted to put his arms around her, but she had a darkness that seemed to stand beside her like an acquaintance that would not go away. He told her the Thibodeaus were coming for supper. "It's only right," he said. Olive wiped sweat from her upper lip, turned to rip up a clump of onion grass. "Then that's that, Mr. President," she said. "Give your order to the cook." On Friday night the couple followed him home, and the young Henry shook Olive's hand. "Nice place here," he said. "With that view of the water. Mr. Kitteridge says you two built this yourselves." Christopher sat sideways at the table, slumped in adolescent gracelessness, and did not respond when Henry Thibodeau asked him if he played any sports at school. Henry Kitteridge felt an unexpected fury sprout inside him; he wanted to shout at the boy, whose poor manners, he felt, revealed something unpleasant not expected to be found in the Kitteridge home. "When you work in a pharmacy," Olive told Denise, setting before her a plate of baked beans, "you learn the secrets of everyone in town." Olive sat down across from her, pushed forward a bottle of ketchup. "Have to know to keep your mouth shut. But seems like you know how to do that." "Denise understands," Henry Kitteridge said. Denise's husband said, "Oh, sure. You couldn't find someone more trustworthy than Denise." "I believe you," Henry said, passing the man a basket of rolls. "And please. Call me Henry. One of my favorite names," he added. Denise laughed quietly; she liked him, he could see this. Christopher slumped farther into his seat. Henry Thibodeau's parents lived on a farm inland, and so the two Henrys discussed crops, and pole beans, and the corn not being as sweet this summer from the lack of rain, and how to get a good asparagus bed. "Oh, for God's sake," said Olive, when, in passing the ketchup to the young man, Henry Kitteridge knocked it over, and ketchup lurched out like thickened blood across the oak table. Trying to pick up the bottle, he caused it to roll unsteadily, and ketchup ended up on his fingertips, then on his white shirt. "Leave it," Olive commanded, standing up. "Just leave it alone, Henry. For God's sake." And Henry Thibodeau, perhaps at the sound of his own name being spoken sharply, sat back, looking stricken. "Gosh, what a mess I've made," Henry Kitteridge said. For dessert they were each handed a blue bowl with a scoop of vanilla ice cream sliding in its center. "Vanilla's my favorite," Denise said. "Mine, too," Henry Kitteridge said. Excerpted from Olive Kitteridge by Elizabeth Strout. Copyright © 2008 by Elizabeth Strout. Excerpted by permission of Random House. All rights reserved.